The term "Only Begotten Daughter" appears over 180 times in Father's words. In the first CSG I found over 10 quotes saying that True Mother is the Only Begotten Dauther (See some of them in the comments below). Denying this fact, one denies CSG, denies TF's teachings and denies TP. In DP, the very concept of True Parents is "the first sinless couple giving Rebirth to the whole of humanity"; signifying that "sinless Bride, prepared by God" has to appear (Rev. 19:7). Together they give the raise of the God's lineage where all of humanity should be engrafted. DP explains, that Mother is the fruit of 2000 years indemnity, expressing for the first time God's Feminine Characteristics. Meaning; if the previous 2000 years were for Jesus to be born sinless; the last 2000 years were for a Bride to be born sinless. True Mother is the Only Begotten Dauther, but Sanctuary Church keeps accusing this as a new theology. Of course, since it does not fit with Hyung Jin's new theology. It's a fact, Hyung Jin denies CSG, denies Father's teachings and denies True Parents. But it is the first CSG, where Father sais, the Only Begotten Daughter is so important, that there will be fights on this issue in the future. Well here we are! Thus restoration continued, to prepare "The Only Begotten Daughter". Read, True Mother's Mission as the Holy Spirit. However, the fruit of Christianity (the bride) was not enough pure and Satan could invade it. Meaning, the conditions made in 6000 years of restoration, was not yet enough to give birth to sinless daughter. Read, How wonderful if Father Married only True Mother. Think seriously how important was for Father to find daughter in which no trace of Satan persists. To open the way for men to be liberated from Satan, Jesus was the first to reach individual perfection. To open the way for women, Mother is the first to reach perfection. But DP says, individual perfection is not enough; To open the way for true families, True Parents are the first. If you study Father's course you'll find out that Mother is born sinless based on True Father's successful indemnity and that of the churches prepared to accept him. Add the conditions made by the Han tribe and that she is born in 3 generations prepared daughters. Read, How was Mother born without Original Sin. You can clearly see that there are cosmic, national, tribal, family and personal conditions guarantying that Satan will have no foundation to invade her. This fact is visible when you compare her unity with Father and how vulnerable was the 1st wife. Mother's victory was not once ceremony, one prayer (as Sanctuary Church see it); it was a lifetime of unwavering obedience. To be able to eliminate Mother they are changing even basic theology; They say, "Ok, she may be the Only Begotten, but she is not born sinless". But the very concept of Only -Begotten is "The First Born Sinless". What's sinless? 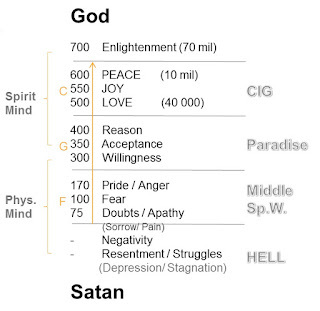 Father talked about how in the future science can measure the frequency of spiritually developed people. Today that's possible and you can see clearly that Father and Mother vibrate above the Completion Stage of Growth, which is in God's realm. Every person has certain vibrational energy around himself (Aura). This energy reflects the combined informational field of all your cells. To be free of Satan's attacks, a person should not have vibrations attracting such low spirits. True Parents are real Peacemakers - resonance above 600 Hz. Their hearts touch millions of people and move nations, as we see Mother does these days. 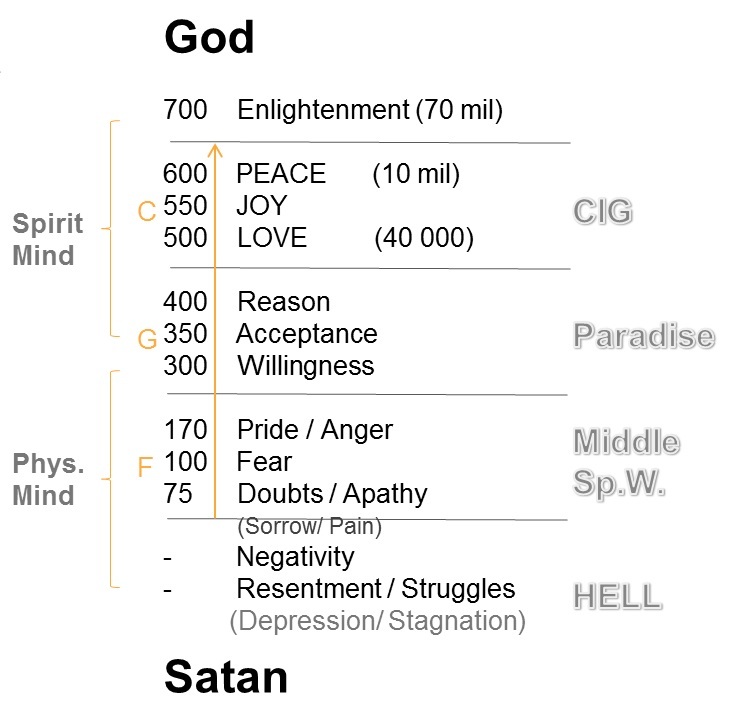 If 'sin' is the common base with Satan, you can see on the chart, that being in resonance under 100 is automatic contact with low spirits - so it's a sin. Fear is 100, but it leads you down to Doubts and Painful heart, which may turn you negative, rebellious, resentful (like H2). More details..
Born sinless, does not signify 100% of the lineage purified before birth. Let's say God's work of restoration was to purify 80-90 percent, and one has to grow afterwords and restore the rest. In Mother's case, she is born and raised based on Father's victories, not just the Christian foundation. That's why there were many declarations where Father proclaimed that Mother reached each of these levels. But the final level of God's liberation was the Foundation Day, when Heaven (centered on Father) and Earth (centered on Mother) were united for the first time; Thus God's Kingdom (CIG) could start. The problem with Sanctuary Church is all about "vibrational mismatch". In therir sermons we see resonance of fear, doubts, negativity, while in Mother's speeches we see God's heart and love. Those with low resonance see only negativity and doomsday, those with high resonance see the building of God's Kingdom. What's the use of Bride, after TF is in the spirit world? Sanctuary Church uses our ignorance. In fact they are accusing Mother for repeating Father's words. Fact is, Father said that Jesus is the Only Begotten Son and that Mother is the only Begotten Daughter born 2000 years later without original sin. Father says, he didn't need to be born without sin, just had to inherit Jesus foundation, but Mother, as the first restored woman, had to be born of pure lineage... These are all Father's explanations. (1) God’s only begotten son and daughter are the first couple in His love. (2) Father, as individual cannot enter Heaven. He needs only begotten daughter. This was Father's mission, to restore that loss, to restore only begotten daughter and the first true family, clan and nation. Mother's help and role was crucial all the way. Especially now, when she, united with Father in the sp.w. unites the Cosmos to establish God's first restored nation, CIG. We see Mother constantly talk and mobilizing us about that. Read to see a glimpse into the great work Family Federation is doing on world level, following Father's vision. We see God's Ideal being realized in front of our eyes with amazing speed, through the guidance of True Mother. Sanctuary Church like to quote Father’s last public speech: “I Have no wife! Mother is doing whatever she likes!” (July16 2012). The correct translation is: 1:05:22 "I have raised [True] Mother. [If not for me,] there would not have been [Heavenly / True] Mother. There would not have been Rev. Moon's wife." How easy! Take wrong translation and destroy Father? What is their real motivation? What is the force behind this deception and lies? Where is their conscience? "The problems afflicting humanity can only be resolved.. based on true love that my wife and I, the True Parents, have learned from Heaven and have championed and taught throughout our lives." “Under True Mother as the victorious representative of the world’s women, women can establish now the model of a true mother and true wife and form ideal families through a true love movement." Jesus said, that we will recognize the Messiah, by his fruits. There is no higher evidence for the victory of True Parents, then the way they are restoring humanity and building the World of Love and Peace. Amazing community is now forming around Cheongpyong Lake. You see a new pure, happy and creative culture rising among the thousands of second gen. children living and studying there. And this is only a glimpse into what's coming in near future, when big communities of few generations start appearing everywhere around the world. Number of nations already educating their citizens in the Culture of Heart. In special-chosen nations rural areas with 80 to 100 % Blessed families. The Culture of Heart spreads like fire. Close to 400 families already fulfilled the Tribal Messiah mission to Bless and Educate 430 couples. The magic happens in so many nations; Some Buddhist, some are Hindu or other religion... yet Tribal Blessings and the spread of the Culture of Heart is happening very fast. With the current temps of education... the estimates are 10 mill. new Blessed Families educated until 2020. But there are many additional effects... Already a Christian Leader, after going through 40 day WS, is teaching DP in his church. He alone has millions of followers. They started using Family Pledge and True Parents' picture. True Mother Born Only Begotten Daughter. Sanctuary member, Deny this Truth and Accuse True Mother when say she only begotten daughter. 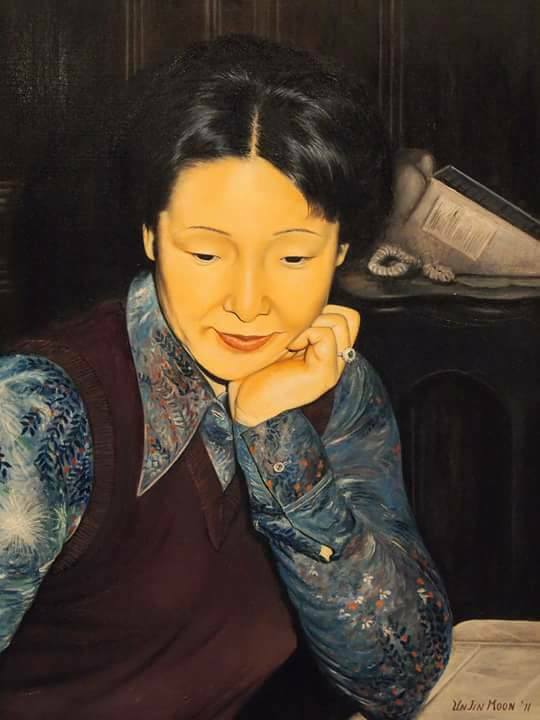 Father Speek "It is an original requirement that True Mother must be an only Daughter. Adam was the original only Son; Jesus was the only Son. The Lord at the Second Advent is also the only Son from the perspective of God's Will. Since the man through whom God accomplishes the Will is His only Son, the woman must be His only Daughter. then will the tribe begin to expand"
restoration has been a sorrowful history. – His only begotten son and daughter." True Parents who come in the Last Days.